In a large, deep skillet, heat the 6 tablespoons of olive oil. Add the jalapeños in an even layer and cook over moderately low heat, without stirring, until softened, about 6 minutes. Using a slotted spoon, transfer the jalapeños to a plate. Add the chopped tomatoes to the skillet and cook over high heat until they release their juices, about 4 minutes. Using a slotted spoon, transfer the tomatoes to a large bowl. Boil the tomato juices over high heat until thickened, about 8 minutes, adding any accumulated juices from the bowl. Return the tomatoes to the skillet and season with salt. Meanwhile, light a grill. Spread out a double layer of heavy-duty aluminum foil that's 12 inches longer than the salmon fillet. Set the salmon in the center of the foil, skin side up, and rub it with olive oil. Using the short ends of the foil as handles, carefully set the salmon on the grill. Cook over moderate heat for 6 minutes. Transfer the salmon to a work surface. Carefully flip the salmon fillet onto a fresh double layer of foil so it is skin side down. Season with salt and pepper. Return the salmon to the grill and cook over low heat until the salmon is just opaque throughout, about 10 minutes longer. Spoon the tomatoes and their juices onto a long serving platter. Using 2 long spatulas, carefully slide the salmon filet onto the tomatoes, leaving the skin behind, if desired. 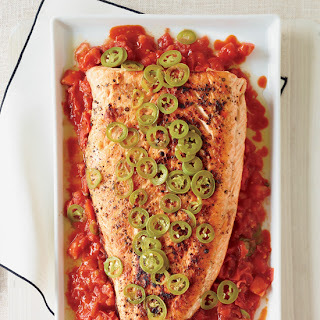 Top the salmon with the jalapeños and serve.